LP edition of 100 copies in a hand printed heavy gatefold sleeve. The inside gatefold sleeve is hand painted by Anakrid (each unique). Anakrid a day keeps the doctor slurred in a trove of fish-tallowed sling slong. This is what it sounds like when doves cry because the mother ship crashes into their nest in the 6th dimension. With this symphony of sickness comprised of scraped palpitations, pitched whooshes, roaring cathodes and syncopated metallics, Anakrid have another breakthrough chart topper on their bruised hands! These avant-garde hit-makers have real crossover potential, combining the best, most dynamic experimental noise with the very latest drones. This exciting NOW sound is OUT OF THIS WORLD! The long awaited fusion of ritualistic tribalism with the tweaked electro-tech of ancient alien cultures is finally here. Hey kids! 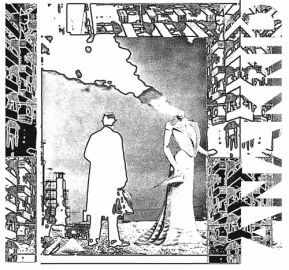 If you love Nurse With Wound, Genocide Organ, Hafler Trio, Muslimgauze, Pierre Henry, Nadja and Harry Bertoia and confusing your parents, then you’ll want to get in on the Anakrid craze before it’s too late. They’ve got a whole new way of kickin’ it old school. With electronics AND home-made instruments, Anakrid CREATES an exploratory atmosphere WITHOUT all those boring, go-nowhere improvisational hang-ups. Everything sounds fresh, progressive and weird!!! It’s just that good. Let’s face it; outsider music has gotten plain boring. Anakrid is just the electrodes to the testicles that left field music has been weeping for since, like, forever. Ex-punks hang up their Mohawks and make good mayhem.